Xiaomi on Wednesday launched the Redmi Pro smartphone. The smartphone will be available in three variants - Helio X20 (3GB RAM + 32GB storage) at CNY 1,499 (roughly Rs. 15,100), Helio X25 (3GB + 64GB) at CNY 1,699 (roughly Rs. 17,100), and Helio X25 (4GB + 128GB) at CNY 1,999 (roughly Rs. 20,200). It will be available in Gold, Silver, and Dark Grey variants. 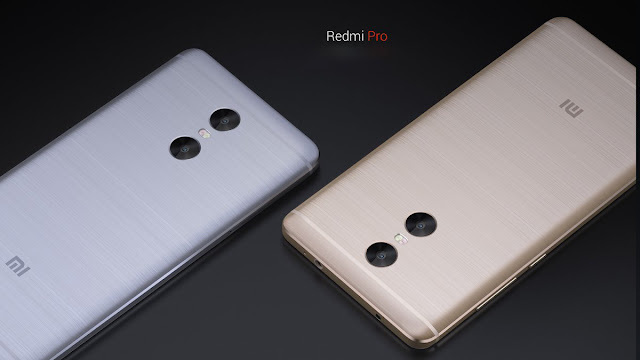 The highlight feature of the Xiaomi Redmi Pro is its dual rear camera setup, with a 13-megapixel Sony IMX258 sensor with a 5-lens module, an f/2.0 aperture and PDAF autofocus, coupled with a 5-megapixel Samsung (unspecified) sensor for the secondary depth-sensing camera. The dual-tone flash module sits between the two lenses. On the front, it bears a 5-megapixel camera with an 85-degree wide-angle lens and an f/2.0 aperture. The phone sports a fingerprint sensor and offers 4G, LTE, 3G, Wi-Fi, Bluetooth, GPS and USB Type-C as connectivity options. It is backed by a 4,000mAh battery with fast charging support. As far as the specifications go, Xiaomi Redmi Pro sports a 5.5-inch Full HD OLED 2.5D curved display with 1080x1920 pixel resolution. It runs Android 6.0 Marshmallow topped up with a layer of MIUI 8. The phone is powered by a deca-core MediaTek Helio X20 processor paired with 3GB/4GB of RAM. It also has 32GB/64GB of internal storage which can be expanded up to 128GB via microSD cards. Xiaomi Redmi Pro sports two rear cameras — a 13MP primary unit and a 5MP module for achieving depth of field and real-time background blur. There is also a 5MP front-facing camera for selfies.